Why do we have a President’s Day holiday? Why should we celebrate the existence of all past leaders of our nation? So many were mediocre leaders, or just objectionable characters. Some of those Presidents we admired in our youth have turned out to be nothing short of trashy people. A case in point was John F Kennedy, a man who was shot down in the prime of his event filled life. With formerly confidential information coming out, it is evident that Kennedy was a womanizer of the first order. His historic affair with Hollywood beauty Marilyn Monroe would have been laudable if it were not for his cheating on one of the most popular, and attractive, first ladies in history, Jackie Kennedy. There were many more JFK dalliances in the Whitehouse, and the Secret Service did their job, well. Then, there was Bill Clinton. I think you get the idea. You can go down the list of Presidents. From Washington to Lincoln, FDR to JFK, and Bush to Bush. These men were good men with the best intentions for our nation. Out of all these men, only two of them merit serious consideration for a national holiday. George Washington and Abraham Lincoln stand out from the crowd. Both of these men lived in times when their principled actions made the difference between a free nation, or no nation at all. Two great men deserve highest honors, and therein lies the problem. The idea of a single President’s day grew out of a conflict in the wish to honor both Washington and Lincoln, each on their birthdays. The solution became obvious to our Congress. Congress established President’s day to honor all of those rascals who had ever served. In other words Congress did what they do best. They established a meaningless holiday fit only for retail sales targeted towards a populace ignorant of why there should be a holiday, at all. President’s Day? We have no idea who we are honoring. Why not enlist the linguistic abilities of our Cajun friends in New Orleans, and co-opt their Super Bowl slogan. 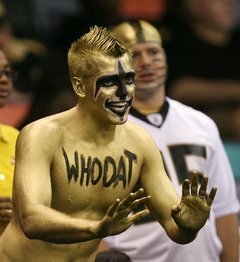 Let’s rename President’s Day, “Who Dat?” day. It makes more sense that what we have now. Filed under: Abraham Lincoln, George Washington, JFK, John F Kennedy, President's Day, Who Dat?